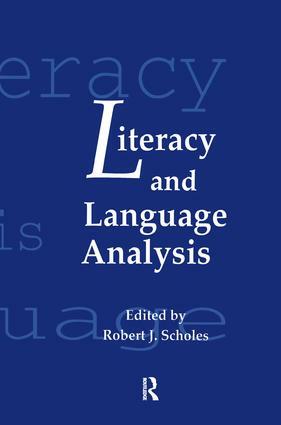 This volume investigates the interconnections between language and literacy in terms of the structures of language as well as the linguistic contexts of literacy. The work for this book was generated in order to focus on studies of the acquisition and impact of literacy on traditional assertions of linguistic analysts. The contributors show that claims regarding descriptions of the linguistic competence of native speakers contain phonemic, morphemic, and sentential constructs applicable only to literate language users. They also suggest that syntactic formalities -- elements lacking extensional reference -- are unlikely in the absence of literacy, and that the notions of "sentencehood" and syntactic well-formedness are functions of literacy. Finally, the book reviews the basic notions of literary relativity and the role of literacy in communication and civilization. "…this collection should be quite enjoyable for those linguists who are interested in the connection between spoken and written language and between language and linguistic analysis…"
Contents: Preface. Part I: Literacy and the Constructs of Language. Section A: Introduction. R. Bugarski, Graphic Relativity and Linguistic Constructs. Section B: Literacy and the Phoneme. L.C. Ehri, How English Orthography Influences Phonological Knowledge as Children Learn to Read and Spell. R.J. Scholes, In Search of Phonemic Consciousness: A Follow-Up on Ehri. P. Prakash, D. Rekha, R. Nigam, P. Karanth, Phonological Awareness, Orthography, and Literacy. Section C: Morphology. R.J. Scholes, On the Orthographic Basis of Morphology. Section D: Literacy and the Sentence. J. Miller, Spoken and Written Language: Language Acquisition and Literacy. P. Karanth, M.G. Suchitra, Language Acquisition and Grammaticality Judgments in Children. R.J. Scholes, Utterance Acceptability Criteria: A Follow-Up to Karanth and Suchitra. Part II: Literacy and the Context of Language. D.R. Olson, Writing, Literal Meaning, and Logical Proof. P.G. Meyer, The Loneliness of the Long-Distance Writer: On the Pragmatics of Written Communication. P.G. Patel, Ancient India and the Orality-Literacy Divide Theory.